XR-5® geomembranes provide over 300% higher puncture strength vs twice as thick 60 mil HDPE and over 200% better tensile strength. Additionally, the prefabrication of XR-5® geomembranes allows for improved liner integrity and significantly reduces the number of field seams. XR-5® geomembranes are the strongest, most durable geomembranes in use today. If your project demands the highest puncture strengths in the harshest of environments then XR-5® is the right Geomembrane. XR-5® was developed to contain and protect against acids, oils, methaned and alkalis. Across the world, XR-5® is being used for pond liners, secondary containment, floating covers and wastewater baffles. XR-5® brochure and technical data. ULC's fabrication facilities have a fully stocked inventory and can meet the most demanding project deadlines. Our highly trained fabrication staff can complete your project quickly and with the highest quality. 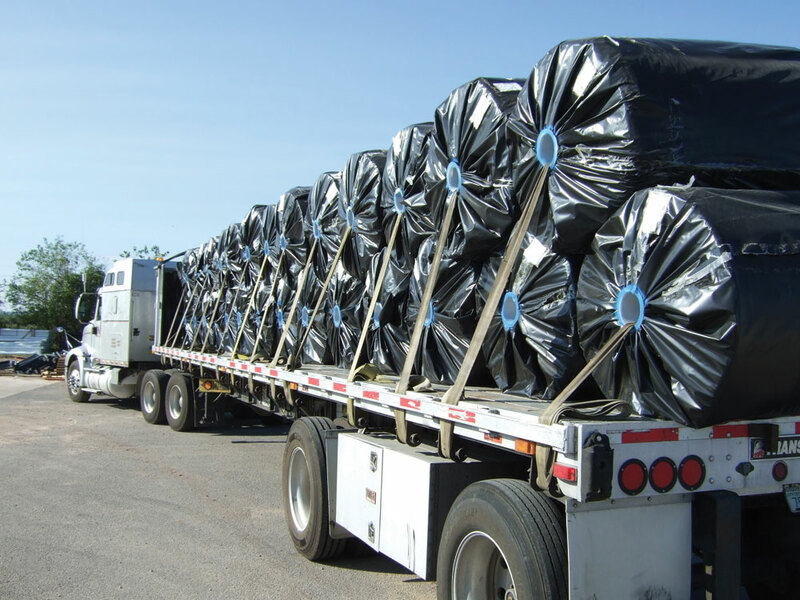 Every liner that leaves our facility has been inspected by both an IAGI certified and GRI Licensed QA/QC Liner Inspector to ensure the highest quality liners available. We can provide custom panel sizes of various geomembranes to meet your design specifications or provide you with one of many pre-fabricated membranes. Using the latest in heat fusion technology we manufacture large panels quicly and in many cases can ship the same day. Our trained liner crews have been providing custom liner installations around the United States for over 25 years with millions of square feet of material installed. From small custom EPDM fish ponds and multi-acre polypropylene Aquaculture projects to LLDPE fresh water impoundments and HDPE landfill liners. We have the equipment, training and experience to provide high quality installations at your facility. Firestone GeoGard EPDM Geomembrane is available in a variety of membrane panel sizes to reduce the amount of field seaming needed. Additionally, Firestone's QuickSeam™ Tape provides an easy and dependable seam solution without requiring special tools or utilities for installation. Firestone GeoGard EPDM Geomembrane can elongate over 300%, offering exceptional conformance and lay flat characteristics that are ideal for irregular shapes and contours. Even when exposed to UV, ozone, extreme temperatures and other harmful environmental conditions. Firestone GeoGard EPDM Geomembrane's specially compounded material prevents cracking. The result is outstanding age stability with little or no maintenance. Firestone GeoGard EPDM Geomembrane is specifically formulated to be safe for fish and plant life.